Are you a restaurant owner looking for help with your direct mail campaigns? No matter what type of printed format you are looking for, The BLU Group – Advertising & Marketing in La Crosse, Wisconsin can help. 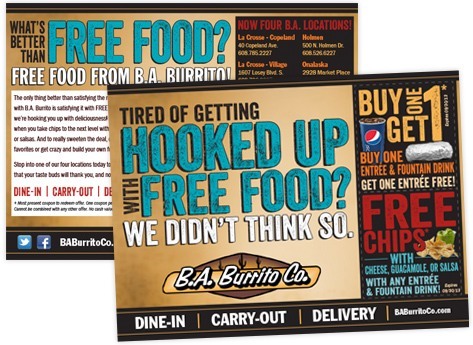 Our design team is experienced in working with restaurants using direct mail to show off promotions and services with a crafted message that gets consumers to take action. Some examples of popular formats include: postcards, booklets, self-mailers, and more. It’s time to take the next step! Contact us today by calling 608-519-3070 for a free consultation for your direct mail campaign.